Former UN head Kofi Annan has condemned "gross and systematic abuses of human rights" in Kenya, after a visit to violence-hit parts of the country. 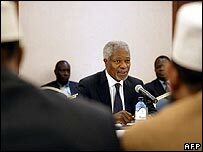 Mr Annan said conflict may have been triggered by disputed elections, but it had evolved into "something else". The facts had to be established and those responsible held to account, Mr Annan said on his return to Nairobi. Dozens more deaths were reported on Saturday, with corpses bearing the marks of brutal violence. Police brought 16 badly burnt bodies to the mortuary in Nakuru, the capital of Rift Valley province. Nine other bodies had been recovered the previous evening, reports said. Some 15 bodies - covered in arrow wounds - were reported to have been recovered following fighting between rival communities in the district of Molo. Mr Annan - in Kenya to mediate attempts for a political solution - was flown over Nakuru on Saturday as part of a tour that also included visits to Eldoret and Molo. 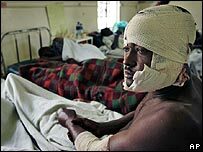 Hospital staff in Nakuru said they had received the bodies of nine more people, hacked by machetes or killed by arrows. Earlier the authorities had imposed an overnight curfew across the city in the wake of renewed inter-ethnic conflict. Rival gangs of young men battled with machetes, metal bars, bows and arrows, while thick smoke billowed up from burning buildings. The violence came despite hopes of progress after President Mwai Kibaki met opposition leader Raila Odinga for the first time on Thursday since December's disputed polls. Mr Annan set off from Nairobi shortly after first light on Saturday to see for himself some of the destruction and human misery caused by more than three weeks of violence. He visited some of the thousands of people in Eldoret whose homes have been destroyed or who moved to the town to try to find shelter. The former UN chief also boarded a helicopter to fly to Molo district where many have been killed. Speaking in the capital, Nairobi, Mr Annan said: "What we saw was rather tragic. We visited several IDP [internally displaced persons] camps, we saw people pushed from their homes, from their farms, grandmothers, children, families uprooted. "And I think it is important that all Kenyans respond with sympathy and understanding, and not try to revenge." He also said there needed to be fundamental changes to Kenya's institutions to prevent a repetition. "We cannot accept that periodically, every five years or so, this sort of incident takes place and no-one is held to account. Impunity cannot be allowed to stand," Mr Annan added. Tanzania's former President, Benjamin Mkapa, travelling with Mr Annan, said: "The political crisis in the country [has caused] a state of agony and despair. We console the people." There has been sporadic gunfire in Nakuru on Saturday. The BBC's Adam Mynott says that some protesters erected a barricade across the main road and many homes have been burnt in the town. Hundreds of people have sought refuge in churches or friends' homes. There are also reports of truckloads of many young men being moved overnight to a village on the outskirts of the town. The unrest triggered by the election on 27 December has driven 250,000 people from their homes. Mr Odinga says he was robbed of the presidency.